Spurred on by the excitement of yesterday's handspun, I made a start on the next lot of roving - something more understated and plain. The fiber is lovely and the spinning is going really well so far. As several people have commented (and emailed) with questions about spinning and which links/tutes I have used etc, I'll be posting more about it later this week - but if you missed my previous spining posts you may like to take a look here and here. Despite the appalling mid-May weather (7°C and wet today!) thoughts have turned to summer knits and the next knitalong. If you'd like to join in the conversation, please leave a comment below or visit the facebook page where the consensus seems to be a lightweight shawl, or a choice of shawls from a chosen designer. What do you think? Zuzu's Petals cowl was suggested and whilst I feel it's too small a project for a knitalong (I could finish it in a day if I had a whole day to knit) loved the pattern and cast on immediately. I'm onto the lace section and plan to have it finished at the weekend. If the weather doesn't improve I'll be wearing it this 'summer'. Our book club novel this month is Life After Life. I am enjoying it so much that I also downloaded it from Audible to listen whilst busy around the house, and when spinning in the evening. I'll tell you more about it when it's finished - which will probably be quite soon as I'm over half way already. I'm also dipping into my favourite book after receiving a new edition. So there's a lot going on, and I still have a few books (and projects) I need to tell you about - I'll try to sneak in an extra post over the weekend. I can't believe how quickly you seem to have picked up spinning, your yarn looks lovely! Ooh, I'm so tempted to try my hand at spinning. It looks like you're making great progress! Your yarn looks fantastic! Fantastic! I'm a huge fan of Philip Pulman. I enjoyed His Dark Materials, but got drawn into the Sally Lockhart novels when I was younger. That fibre looks fabulous. I nearly bought some Jacob. I'm taking it that it's nice to spin? That brown roving is smokey! Love that. Sunny but cold here. Scattered showers tomorrow supposedly. I love your roving - it's glorious. 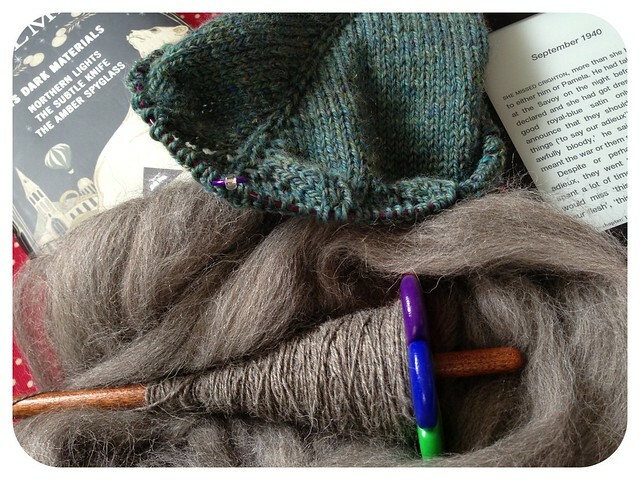 You're inspiring me to pick up my spindle again - I've got some delicious bfl to spin. Time. Time. Time. I need to find some more! Came by specifically because I was going to badger you about a knit-a-long....so need one! Very up for doing a shawl.....I've seen a few lovely ones recently....I shall set my mind on it!